Fragile (Southwark Playhouse, 2011), part of the project Theatre Uncut, is a short protest play about (threats of) suicide by young men as a form of protest in the context of “austerity Britain” (2010–) and the Arab Spring (2010–2012). In this duologue, while Jack is performed by an actor, Caroline is performed by the audience, who is asked to read her lines on a PowerPoint projection since the cuts to public spending have made it impossible to hire a second actor. In this way, an entrenched characteristic of the contemporary globalised world, which the play deals with thematically—precarity—takes over the play’s form, connecting both. 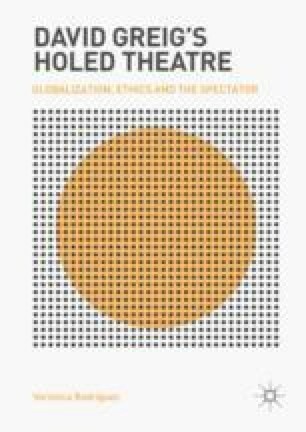 The chapter argues that Greig interweaves these political events in order to put forward a sense of global fragility, which Fragile masterfully illustrates through what Rodríguez calls “sharing doing” and “spatial transcorporeality”.